I'm Curious Too: 8 Glasses of Water A Day--How Did It Come About? As a child I've heard my mom nagged at me for drinking too little water. Seriously I preferred flavored water to plain water back then. But most if not all the medical advisers I've met thus far have said that drinking 8 glasses of plain water a day is a must, in addition to other liquid like coffee and soup. That sums up to like... 10 glasses of liquid a day? Do we really need that much water in our system everyday? Who proposed that ludicrous idea anyway? 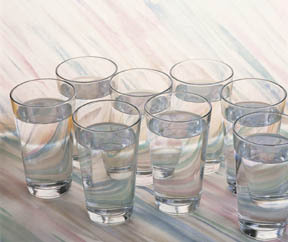 It turns out that there is no scientific proof to back the "8 glasses of water a day" rule. It was first written by Dr. Frederick J. Stare, one of the top nutritionists in the U.S in a book co-authored with Dr. Margaret McWilliams in 1974. You are recommended to gulp down 6 to 8 glasses of liquid per 24 hours and this can be in the form of flavored drinks, plain water, soup, or even fruits and vegetables. But how did that become "8 glasses of water a day"? Another nutritionist, Dr. Irwin Stillman, who created the populat "Stillman Diet" in 1967 was the one who actually propagated the idea of drinking 8 glasses of water a day. So how much exactly the liquid do we need each day? Well that depends on a plethora of factors: your job, your routine, your health, the weather, etc. Athletes and people who work out a lot obviously need more water. People who live in warmer regions obviously need more water. But for the average person, the amount of water needed is proportional to the amount of liquid excreted via urine, sweat, and evaporation, which is about 3 liters for men and 2.2 liters for women per day. That translates into roughly 9.23 glasses (325ml) and 6.77 glasses of liquid for men and women respectively. So the numbers stated by Dr. Stare are still valid. But remember, 9.23 glasses of either tea, coffee, soup, or plain water.